Type of cloisonné enamel in which the metal supporting body has been removed using acid. Plique-à-jour baluster-shaped vase decorated with chrysanthemums in coloured enamels against a translucent pale green background. The base and the upper rim mounted in silver. 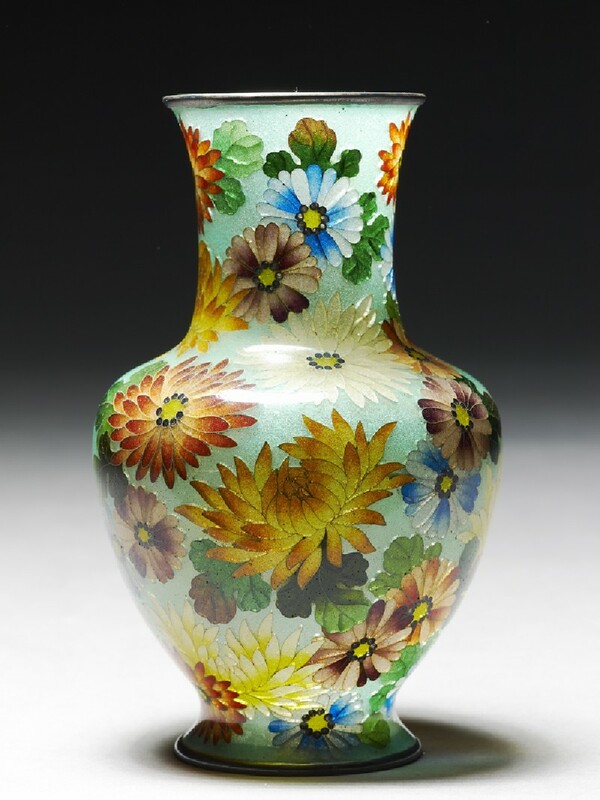 Cloisonné enamel from which the supporting background had been removed, thus rendering it transparent, is called plique-à-jour, (shōtai-jippō in Japanese). It is extremely fragile. This very difficult technique was invented in France and first came to the notice of the Japanese enamellers when it was seen at the Paris Exposition in 1900 by Andō Jūbei. He bought some pieces by Fernand Thesmar, and it was from these that Kawade Shibatarō is said to have learned the technique. The skill spread, and other makers were soon producing it, most notably Hattori Tadasaburō, but we are unable to attribute this unsigned piece.